Planesrunner is a story of parallel universes, and Everett's dad, a quantum physicist working at London Imperial College, was heavily involved in researching these. Soon, Everett goes on a quest to rescue his dad, using just an iPad with an installation of the Infundibulum - the key to the multiverse - to help him on his journey. Highly recommended: a novel which is smart and superb fun. So I was a little doubtful about trying Planesrunner. After all, when China Mieville decided to delve into the YA market, his attempts to make his writing style more accessible resulted in adverb-laden, unreadably bad Un Lun Dun. I needn't have worried. 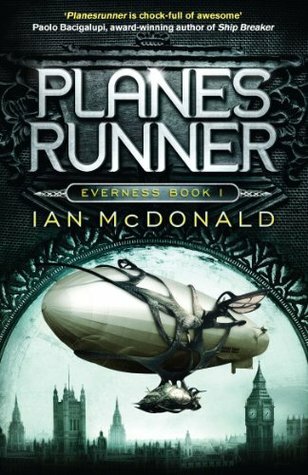 In Planesrunner, Ian McDonald managed to make his prose more accessible without butchering his style. In fact, though it starts out in a neutral, London voice, the story does move the action into a realm where people speak the sort of lively patois that is both understandable yet pleasingly imaginative and different. Ian McDonald's ear for language is second to none. However, this same patois means that Planesrunner is not quite as accessible as Harry Potter or Hunger Games - it is unashamedly a novel for readers who are willing to keep their brains switched on while reading. Huh. I'd seen the reviews for this, and wasn't sure if it'd be my thing, but you make it sound like it's worth a try.